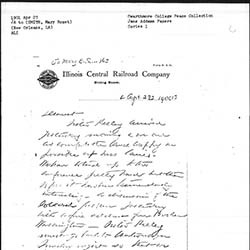 Subject is exactly "Addams, Jane, lectures"
James invites Addams to speak at the American Academy of Political and Social Science's extension program for 1901-1902. 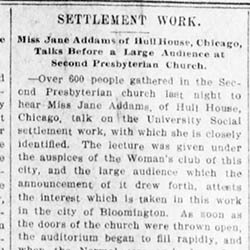 Addams discusses English settlement work at the Kenwood Evangelical Church. 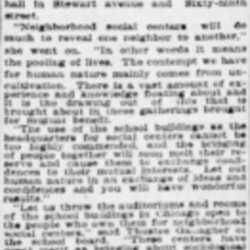 Addams discussed the role of schools in preparing children for life in a speech at the Ethical Society. 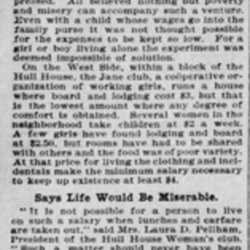 Women argue against setting a weekly salary of $2,50 because it was not sufficient to health and well-being. 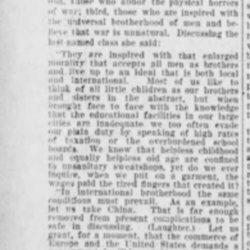 Addams comments on the importance of kindergarten in settlement work at the close of a convention of the International Kindergarten Union. 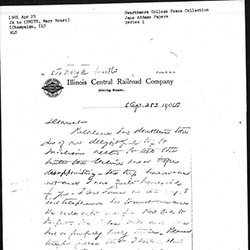 Addams writes Smith about her lecture in Madison, Wisconsin, a trip to Springfield, Illinois, where she met the governor, a property purchase, and her trip to New Orleans. 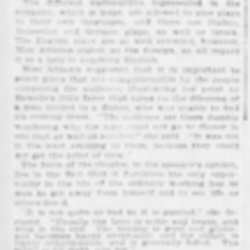 Addams reports on events in New Orleans at the Methodist Missionary Conference, including attending a talk by Booker T. Washington. She also writes about changes in her travel plans and how she wishes that Smith was with her. 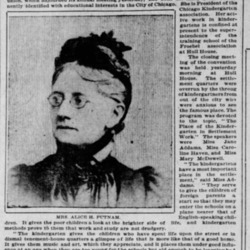 Addams writes Ely about the recent visit of Peytr Kropotkin and her upcoming lectures. 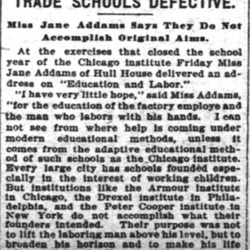 Addams criticizes trade schools in an address to the Chicago Institute. 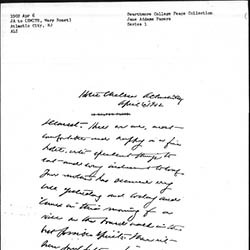 Addams writes Lathrop to choose a day in which she can speak at All Souls Church. 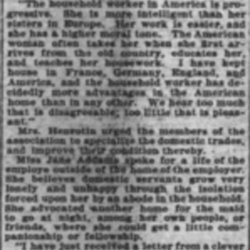 Addams and Henrotin discuss the need to form a union for housewives at a meeting of the Chicago Workingwoman's Association. Addams talks to women about how they can help defeat sweatshops through consumerism. 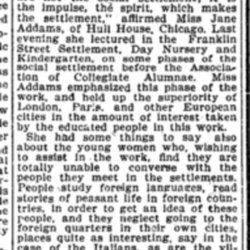 A newspaper report of Addams' speech before the Woman's Club of Bloomington, on the work of the University Social Settlement. 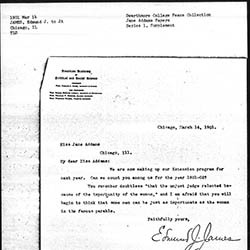 Addams provided a history of settlement work and the basic principles at Hull-House. 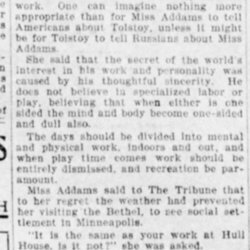 A summary of Addams' talk on Tolstoy and settlements, given at the First Unitarian Church in Minneapolis. Addams questions the idea that women are inherently more moral than men. 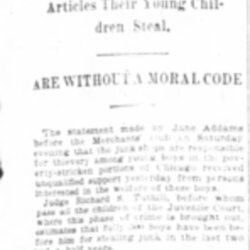 Addams discusses the abuses of the Hull-House day nursery program by lazy parents. 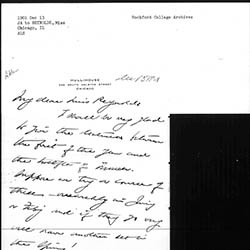 Addams writes Reynolds about plans for a series of lectures. 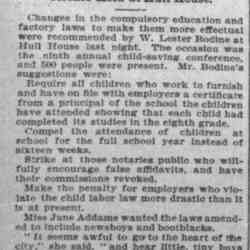 Addams and Bodine discuss changes needed in compulsory education rules to make them more effective. 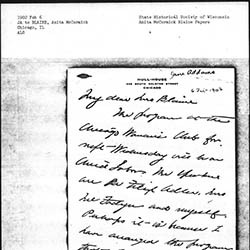 Addams invites Blaine to a speech she is giving at the Chicago Woman's Club. Addams discusses the role of neighborhood centers can play in fostering community. 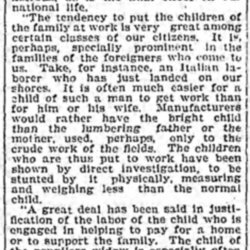 Addams' discusses child labor before the Los Angeles YWCA. With Maud Booth, Addams addresses the Merchant's Club, appealing for aid in helping criminals and rescuing boys who may become criminals. 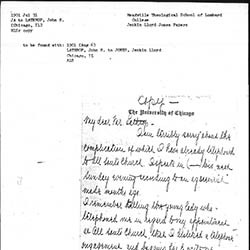 A description of services for John Altgeld, including quotes from Addams and Clarence Darrow's speeches. 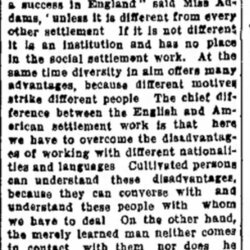 Addams speaks to the Franklin Street Settlement in Detroit about working in a settlement. 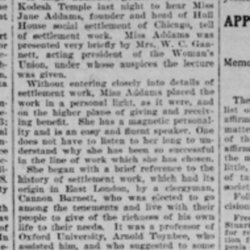 Addams discusses the formation and goals of Hull-House in a speech to the B'rith Kodesh Temple. 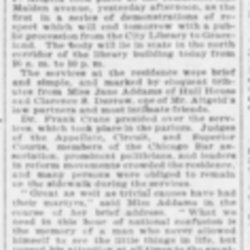 Addams addresses a meeting at the United Charities building in New York and discusses how Hull-House makes use of its theater. 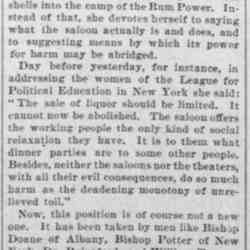 A summary of Addams's speech on saloons before the League for Political Education in New York argues for limiting, not stopping, the sale of liquor. 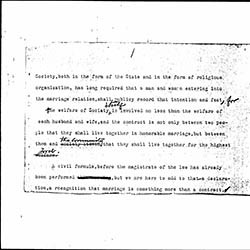 Addams addresses the Ethical Culture Society about those who oppose war, specifically those who believe that war is unnatural. 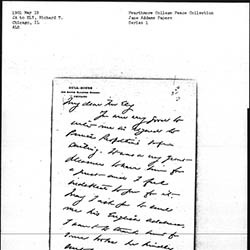 Addams writes Smith about her visit to Atlantic City, New Jersey, and offers news about activities, including a visit with Smith's mother.